Ugh, short post tonight, y'all. I am TIRED. Coming back to school after a five-day weekend was pretty intense. I swear I saw real fear in my students' eyes when I attempted to teach them something (just as they saw the real fear in mine when I realized I had to teach them ... something). 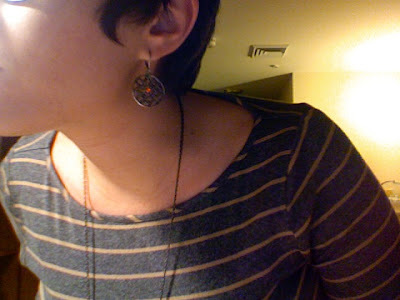 Here are the earrings my uncle and aunt sent from Buenos Aires. Pretty, no? I love the almost Moorish design of the metal (stainless steel, I believe) and the orange stone in the middle. Super-subtle, super-pretty. Anyway, I'm off to hit sleepy-time. Another long day tomorrow! And the next day! Until Saturday! I like the necklace: although it sounds wicked long. I'd love to see what it looks like with the whole outfit shenanigans. Hope your week goes by quickly!! 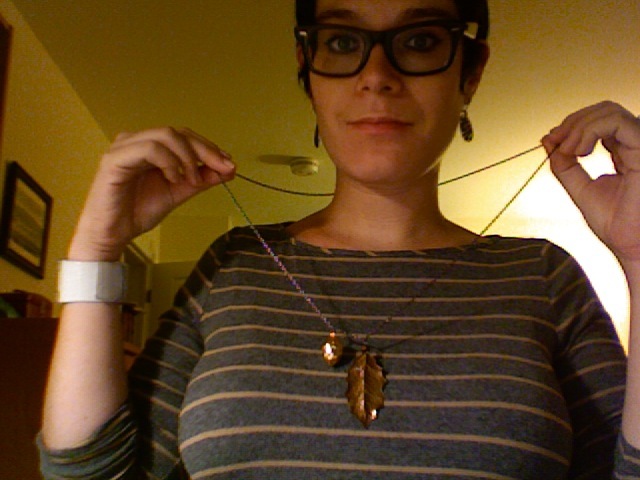 Both the earrings and necklace are beautiful. You're making me want to go buy jewelry, which I'm not very good at. Maybe you can give me a nice jewelry-buying tutorial?